IT’S CIRCLE TIME in Ms. Slee’s all-day kindergarten class at Memorial Public School in St. Catharines. Before getting started, Allyson Slee, OCT, has her 28 students march on the spot for one minute — except for one girl who is across the room sitting alone on a soft chair reading and listening to quiet music. stays regulated when participating in physical activities. Regulated? That’s right: The marching and checklist are tools to help teachers in the DSB of Niagara improve “self-regulation” in kindergarten students. If you haven’t heard of self-regulation yet, you will, as Ontario’s new all-day learning curriculum — which lists building self-regulation as a core goal — rolls out over the next few years. At a basic level, self-regulation is the ability to adapt your mental, emotional and physiological state to the task at hand. If a child needs rest, he should wind down toward sleep. If he’s in the road with a car bearing down, he needs to get out of the way fast. In school, self-regulation enables children to get along with people, control their behaviour and be in the calm-but-alert-and-focused state conducive to learning. Canadian and American data suggest that between 25 and 50 per cent of children going into Grade 1 struggle to varying degrees with self-regulation. “That’s why it’s crucial to focus on it in kindergarten,” Shanker says. Here are four ways to build self-regulation in the classroom. Time for learning together on the carpet tends to run more smoothly when kindergartners have the chance to engage in activities suited to their physical and emotional states. For one, that might mean tactile play with playdough; for another, it means dress-up; still others may seek something quieter. Play-based learning is old news in kindergarten programs. What’s becoming increasingly accepted is that play promotes self-regulation as well as cognitive learning. 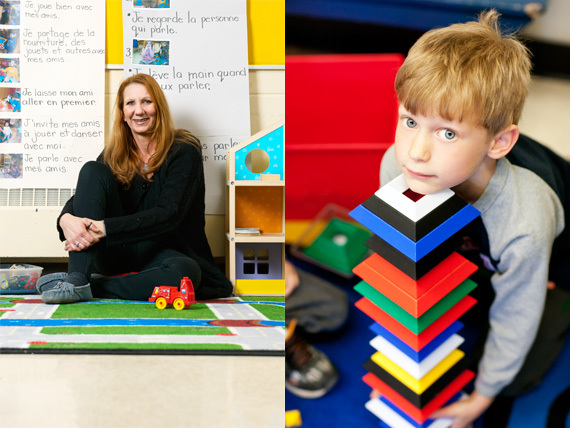 Learning about self-regulation has prompted Chantal Stephens, OCT, a kindergarten teacher at école élémentaire catholique Sainte-Marguerite-Bourgeoys, to rethink her role when her students aren’t getting along. Children are allowed to doodle, chew gum or play with pieces of yarn that are tied to the leg of each desk. Because the students in Allyson Slee’s kindergarten class have a variety of activities to engage them, she is able to find that all-important one-on-one time for children when they need it. Some of the other strategies used by Kitchener teachers might seem surprising. Children are allowed — encouraged even — to doodle, chew gum or play with the pieces of grey yarn that are attached to the leg of each desk. “We’ve found that many children learn better when they are doing something with their hands,” Whittam-Neary says. I can actually concentrate on what I’m supposed to be learning. offering noise-reducing headphones to students who are particularly sensitive to sounds. Learning about self-regulation has caused Chantal Stephens to rethink her role when students aren’t getting along. She now asks questions and prompts children to come up with solutions. “Usually children come up with their own rules,” she says. The final piece of the self-regulation puzzle is teaching children about the concept. McGillivray plans to introduce two specific products to help teachers with this. One is Playtime with Zeebu, a learning aid developed for children on the autism spectrum, designed to teach perspective taking, nonverbal cues and self-calming techniques. The other is the Alert Program, developed by American occupational therapists Sherry Shellenberger and Mary Sue Williams. Alert uses an engine analogy to help children think about their state of arousal, specifically, to identify “engine speeds” (too high, too low, just right) and learn strategies for changing them. McGillivray explains, “During circle time, teachers might ask questions like, ‘How does it feel when your body is revving too high?’ and ‘What sorts of things can we do to put on the brakes when our bodies are revving too high?’ I suggest that teachers give kids a choice of two things to do — physical activity or going to the quiet corner to look at a book for a few minutes.” The idea is to build children’s ability to understand their own physical and emotional states and learn strategies that can help them maintain or change them as needed. 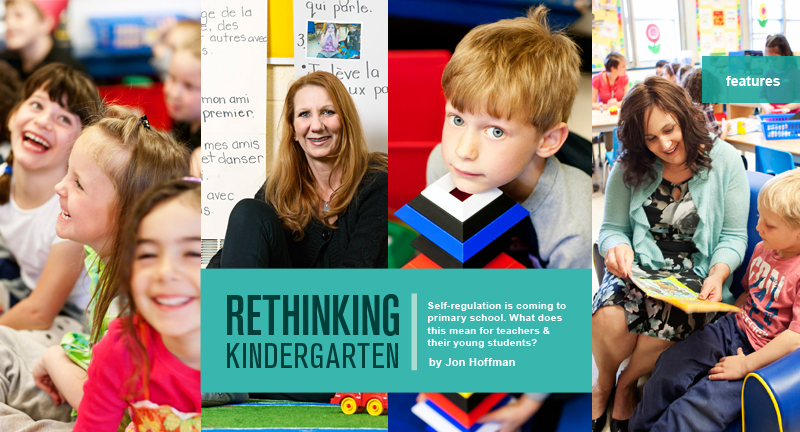 Although the link between self-regulation and learning has solid evidence, it will take time to document how well these pedagogical approaches work with kindergarten students. Some British Columbia school districts are working with the Ministry of Education to develop a research project that will compare self-regulation schools with control schools from the same districts on a number of factors, including student achievement, behaviour and teacher stress.